Home / What Makes A Good Loot Game? I have been a wild fanatical fan when it comes to loot based games. I know there other crazy gamers like me, and Path of Exile is a great example of extreme loot drops and randomization in an ARPG. And of course we have Diablo and Borderlands as some of the most notable games of this “looter” sub genre. But interestingly (to me at least), despite this genres popularity, there aren’t that many games. Looking under the loot tag on steam only brings up 125 games, and you could throw away a good chunk of them as not-really-loot focused. Only 125 Games In Steam Under Loot!? Compare this with the RPG tag: ~8600 games! I know for a fact people love getting new treasure (i.e. loot) in RPG games, so loot and RPG goes hand in hand and yet why do we have so few games focused on deep loot systems? Well if I had to guess, and since I’m making a game solely focused on loot, I’d have to say it boils down to the following reasons. Creating loot that is interesting and diverse is a lot harder than it might seem. It’s very easy to have stuff that’s just junk or just a linear improvement and hence not interesting. If all you’re finding is a sword that does more damage, it makes interesting gear choices pointless, and the game mechanics likely lack depth. Many of my old school favourite RPG’s are famous for this too. A lot of classic RPG’s have the old + HP or + Damage stat for better gear (but then again they don’t have randomized loot either). In order to have dynamic loot you need to have enough stats that are interesting and functionality that is dynamic. This is where League of Legends is a shinning example (though it is designed not to scale forever, but instead only last 40 or so minutes). 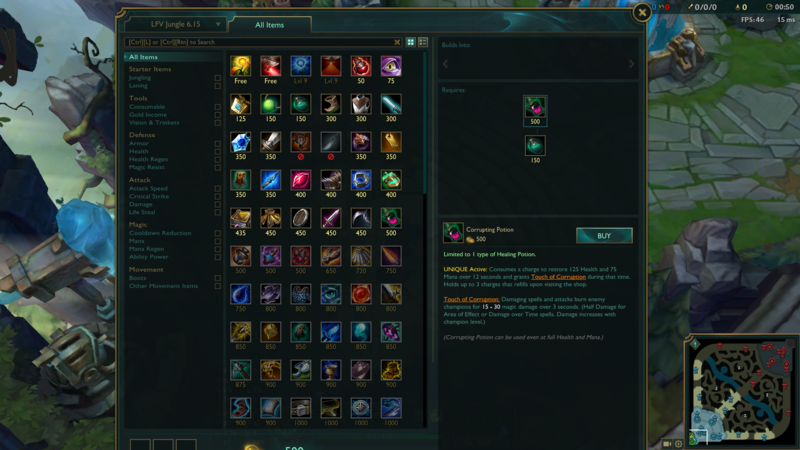 League of Legends focuses on some stat boosts, but also functional variety that is also generically applicable across all classes. This design is not easy but it does pay off. One of my core interests in Grrbls has been taking the dynamic expression of items like those found in League of Legends an applying them to an evergreen RPG looter. A lot of RPG’s have a linear storyline and progression system. This is not a problem per say, but it is when it comes to dynamic loot systems. It’s harder to design for how powerful the player might be if loot is randomized and varied. With a known gear space, the designer could design specific bosses and challenges knowing exactly what the player’s stats will be like. It’s a lot harder when there are all unknowns and it’s hard to make continual challenges that match the players new found power. Many RPG’s are not overly difficult, you can usually grind your way to success. Often being 5-10 levels ahead is enough to blow most bosses out of the water negating all challenge. However as I’ve tried to make Grrbls both loot focused and tactically challenging, it’s been difficult to find the line between engaging difficulty and empowering loot. This is more of a pure guess on my part but I think it’s harder to position a game as a “Looter” focused RPG when there are so many RPG’s that one must compete with. However I think this is an asset if used correctly. One of the things I’m happy to say about Grrbls is there is no story. None. Zip. Nadda. This is because I want Grrbls focused purely on mechanics. Almost every RPG I can think of has a story, and while some are amazing, many are not. And these storylines get in the way of what might be otherwise good pure combat games. I think if more RPG’s dropped their stories and focused on loot and battle mechanics there might be more interest — and of course I could be completely wrong too! I think loot games are a hot need in the gaming community but not that many games come out to scratch that itch. It is my hope that Grrbls fits into this mold and people enjoy it’s deep loot and RPG battle mechanics and it’s evergreen (level up forever) systems.